The Clipper Wind system shares the same 110mm square case as its sister instruments in the Clipper range. the display is exceptionally large and clear, with 60 segments for full 360 degree direction indication. Windspeed is shown in knots, M.P.H. or Metres/second. The pointer style is selectable, from the single segment shown above, to multi segments for greater clarity or a ‘windex’ style indicator. The new masthead unit has NMEA 0183 output sentence MWV and supplied with 20 metres of cable. 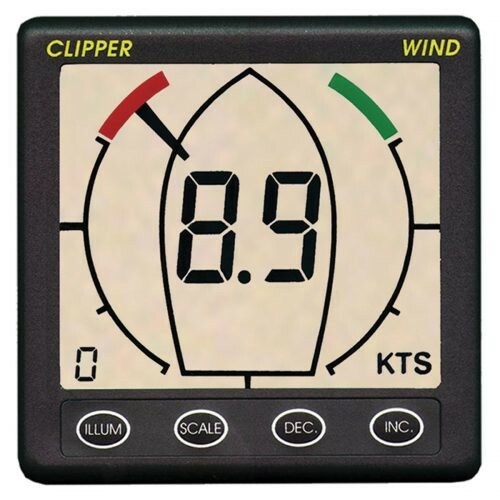 Clipper Wind system is supplied complete with Display unit, masthead unit with cable and mounting blocks.